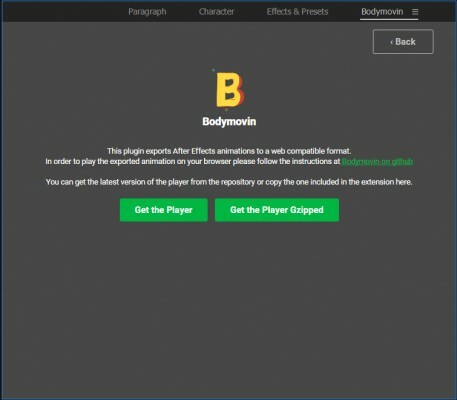 The MIT License (MIT) Copyright (c) 2015 Bodymovin Permission is hereby granted, free of charge, to any person obtaining a copy of this software and associated documentation files (the "Software"), to deal in the Software without restriction, including without limitation the rights to use, copy, modify, merge, publish, distribute, sublicense, and/or sell copies of the Software, and to permit persons to whom the Software is furnished to do so, subject to the following conditions: The above copyright notice and this permission notice shall be included in all copies or substantial portions of the Software. THE SOFTWARE IS PROVIDED "AS IS", WITHOUT WARRANTY OF ANY KIND, EXPRESS OR IMPLIED, INCLUDING BUT NOT LIMITED TO THE WARRANTIES OF MERCHANTABILITY, FITNESS FOR A PARTICULAR PURPOSE AND NONINFRINGEMENT. IN NO EVENT SHALL THE AUTHORS OR COPYRIGHT HOLDERS BE LIABLE FOR ANY CLAIM, DAMAGES OR OTHER LIABILITY, WHETHER IN AN ACTION OF CONTRACT, TORT OR OTHERWISE, ARISING FROM, OUT OF OR IN CONNECTION WITH THE SOFTWARE OR THE USE OR OTHER DEALINGS IN THE SOFTWARE. Exports animations to json files and pngs (if necessary). Animations can be played on the web via the bodymovin player or natively in iOS and Android through Lottie. 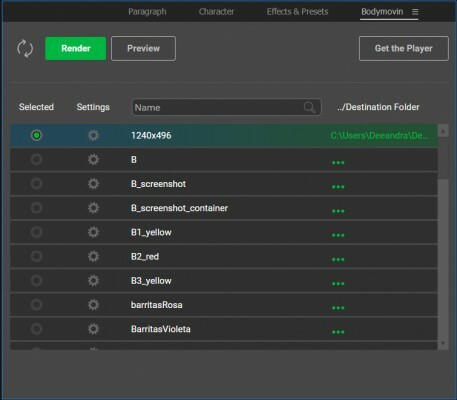 For playing the animations, get the player in the extension panel, and load it in a browser. A single text declination is supported per textbox. Not supported: text decorations like Small caps, or Vertical Scale. Expressions. Partially supported. More and more expressions are supported on each release. If you have any trouble with one, let us know. - NEW: updated build process. Removed vulnerable dependencies. - REFACTOR: canvas shape renderer had an important refactor. Should support new render cases and have a performance improvement. 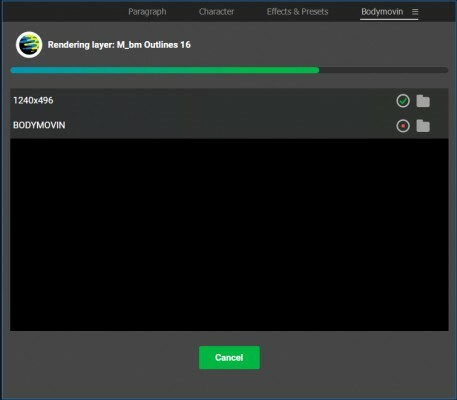 - FIX: exporting images for older version of AE. - FEATURE: if needed can skip images export once exported a first time. - FEATURE: added getDuration method. In frames and in seconds. - CHANGE: removed M0,0 added to every path. Should fix chrome issues. - EXPRESSIONS: support for "anchor_point"
- FIX: destroy method wasn't releasing all memory if a single animation was loaded. - FIX: IE masks fix when used as Alpha Masks with gradients.